Milana, Janaya, Khadiza, and Tyra-a big hello to you and I'm so glad you like my stories. Sarah, I just had a new book come out. It is called A Tale of Two Sisters. Lay plo, my grandmother was a kind lady. She always made my favorite chicken and dumplings when I visited on Sunday afternoons. She made all my clothes and even my Barbie clothes for me when I was little. But more important than all that-she took time to talk to me. 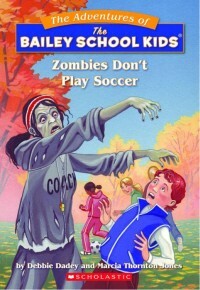 As for my favorite Bailey School Kids book-that is hard to decide! 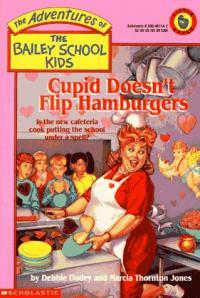 One of my favorites for this time of year is Cupid Doesn't Flip Hamburgers. Areesha, Jack, and Lay plo, It would be fun to come to your school, ask your teacher or librarian to contact me here. Lauren, I definitely think if you are going to write about an animal you should study it. For the book I just finished, I studied about eels and sculpting. I do think wolves are cool, but I love dogs and they are related. Abrish, I hope you have a great winter too! Have you had a lot of snow this year where you live? So far, where I live in Pennsylvania in the US we haven't had a ton of snow this winter, but we're supposed to get another storm on Monday. Emma-Lee, your writing is very funny! I think chapters should be as long as needed. Most of mine are around three pages. If you like kitties, then you should definitely write a story about them. I think three main characters are usually plenty. Hailey, I'm so glad you are enjoying Dragons Don't Throw Snowballs. I like snow too-as long as we don't get too much at once. Here are some other snowy-day books you might like. Hi Lauren, five pages is probably fine for your chapters. A Tale of Two Sisters is about two sisters, Echo and Crystal. Echo is very excited when she finds something human, but Crystal claims she found it first. It starts a sister war! Dear Jack, I'm so glad you like Santa Claus Doesn't Mop Floors. It would be fun to come to Canada. Your school can find out about me visiting by looking at my scheduling page. On Tuesday, I Skyped with a class from Mexico. Maybe I could Skype with your class if I can't visit. Hi Janaya, so glad you enjoy my stories. MayMay, hope you like reading my new book, A Tale of Two Sisters. Do you have a sister? I always wanted one. Lay plo, the Bailey School Kids series was named after my grandmother, Lillie Bailey. She was a very special lady. I have 162 stories that I have sold to be made into books. Marcia T. Jones and I met when we taught at the same school. Hailey, I'm so glad you like Vampires Don't Wear Polka Dots. It was my very first book! Thank you Farien for being my #1 fan! Jaidyn, I'm sorry you don't like my books. Have you read one?